There are no possessed dolls in the 1972 thriller Child's Play. It does, however, have several ingredients that would indicate a pulpy good time like its 1988 namesake. The film is set in a Catholic boys' school where odd, sinister things keep happening to the students, with a solid cast that includes James Mason, Robert Preston and Beau Bridges. It was based on a Broadway play that ran for nearly a year in 1970, with the legendary stage producer David Merrick continuing his duties for the film version. While it's likely that adapting a set-bound property like this had its own challenges, Merrick had the film in good hands by employing Sidney Lumet (Dog Day Afternoon, Network) to direct. Oddly enough for such an esteemed director, Child's Play counts as one of the few Lumet films that has never been widely seen or available - until now. A cloistered all-male Catholic school forms the backdrop of Child's Play's action, with a plot that focuses on the long-standing rivalry between two of the school's professors. While literature teacher Joseph Dobbs (Robert Preston) enjoys his job and is well-liked by the student body and faculty alike, all is not peachy keen in his world. 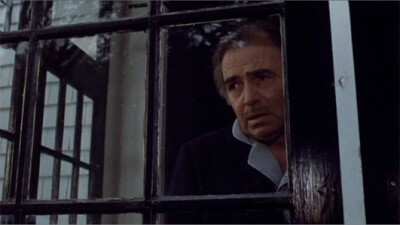 There's something about fellow professor Jerome Malley (James Mason), a more tenured Latin instructor, that bugs Dobbs. When we're introduced to Malley, he's a tired, easily distracted (his mother is dying) shell of a man who seems to be catching on to the futility of teaching a dead language to a bunch of boys who are merely marking time for class credit. Despite all that, there are students who are loyal to him and his teachings. 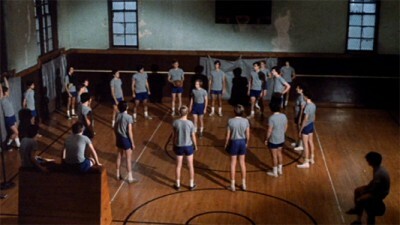 Into this tense environment comes a series of unexplained incidents in which the students perform increasingly violent hazing rituals on each other. The boys are marked with blood, humiliated and induced to mutilate themselves to such a degree that a few of them wind up getting hospitalized. 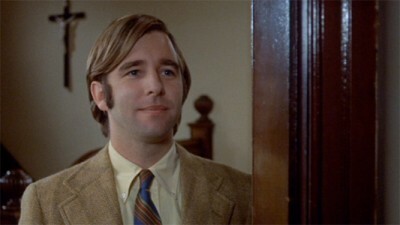 They are a source of concern to the clergymen who run the school, but no serious action is taken until the chipper, idealistic Paul Reis (Beau Bridges) is hired to be the school's new phys ed instructor. A former student at the school, Reis is honored to be working alongside Dobbs and Malley. After witnessing the aftermath of a particularly gruesome hazing incident with the students, however, he becomes drawn into a bizarre situation that ties into the boys' intense, cult-like loyalty to the Robert Preston character. Before film's end, this will involve pornographic magazines, creeping madness and a very high wall. With its many scenes of intense dialogue acted out in a claustrophobic setting, Child's Play seems like a natural for Lumet's skills. The end result, however, is plodding, dated sludge which generated few thrills. The acting is all right, if inconsistent. Preston's jocular but overly chummy performance suggests that his character's interest in the students might be more than academic (what kind of teacher would cradle his arm in a student's arm while walking down the hall?). James Mason runs from poignant to embarrassingly hammy, and Beau Bridges does all right with material that seems a bit out of his depth. The most disappointing aspect of Child's Play comes from its the portentous source material, which (despite a few ballsy, sacrilegious scenes) would have been more appropriate for the quickie-exploitation market of the early '60s. It certainly gets a solid "F" in its main purpose - to convincingly create a compelling world. The film never betrays its stagy origins, becoming so intrinsically tied to the school setting and its closed-in classrooms that a single shot of a traffic and pedestrian-filled outside street serves as sweet relief. Who are these students (not one of whom is developed into a real character)? Where are their parents? We get a few glimpses into the Mason character's home life, but what about those of Robert Preston or Beau Bridges? Had the filmmakers used a tighter, better structured screenplay, we wouldn't need to ponder that stuff. Olive Films' DVD edition of Child's Play serves as another welcome addition to their program of bringing the lesser-seen Paramount films from the '50s through the '80s back into circulation. Unlike many of their other releases, however, I would only recommend this one to those who are curious about revisiting one of Sidney Lumet's flops. Even on that scale, Lumet's The Wiz is a whole lot more entertaining than this muddled, forgettable mess. The DVD edition of Child's Play presents the film in 16x9 anamorphic widescreen, sourced from a print that is in decent, weathered shape. Compared with other Olive discs of early '70s-era films such as Hit! or Tales That Witness Madness, this one comes up somewhat disappointing with a dark, muddy picture that lacks depth. Child's Play's soundtrack is a simple affair of low-key dialogue punctuated with occasional bursts of shrill, out-of-place scoring. Overall, the sound quality is typical of what you'd find on a 40 year-old film. Child's Play holds a lot of potential, with an eerie plot of sinister doings in a Catholic school and smooth direction by the reliable Sidney Lumet. 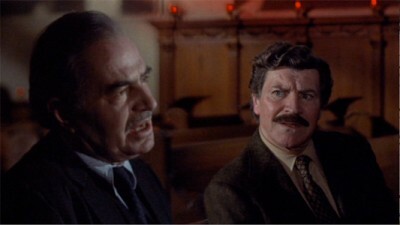 In its defense, it does have a notable work by Robert Preston as a teacher with messiah-like powers over his students. The final film winds up an unsubtle, plodding slog which fails to overcome its stagy origins, however. Skip It.